The message for today is about humility; and for once, Jesus is not the hero of the story. In fact, he is the example of what not to do. Today’s gospel story comes in two parts, both dealing with Jesus’s confrontation with other religious people around the topic of the Sabbath. In act one, Jesus and his disciples are walking on a journey and glean some wheat from a field. As this all takes place on the day of Sabbath, anyone who witnesses their actions is right to point out that Jesus and the disciples are in the wrong. The Sabbath day is a day of rest commanded by God. Journeying from one place to another is something that should be done on the other 6 days of the week. If they absolutely had to embark on a journey on a Sabbath day, the very least they could have done was to pack their lunches the day before. That is simply part of what it means to observe the Sabbath. But here they are breaking long-held religious instructions in plain view. When confronted by others, they do not apologize or offer an excuse. Instead, Jesus equates himself with David, who broke Sabbath in order to feed people bread. Then Jesus goes even further by declaring that he is the Lord of the Sabbath. The religious people find this utterly despicable. If you haven’t picked up on what the big deal is, perhaps it would help to recall that the disciples were teenagers and Jesus was likely in his late-twenties, early-thirties. This is a conflict on many levels, including generational. These young kids burst onto the scene with no respect for religious traditions, customs, or rules; and then have the audacity to say not only are they not sorry, but they are making new rules. And so, the scene is set for act 2, in which the Pharisees watch this arrogant rebellious Jesus enter the synagogue on the Sabbath and heal a man with a withered hand. If you haven’t found this interesting, even with me having just called Jesus “arrogant,” then maybe you’ll find this next idea compelling. Jesus is often made out to the be hero of these stories because he makes the claim that feeding and healing take priority over the religious barriers that would have otherwise prevented them from receiving help. But here’s the catch: this is something the Hebrew people believed already. This was not a new radical approach to Sabbath living. To clarify, by healing the man on the Sabbath Jesus isn’t really even breaking Sabbath rules. Even if it was technically a violation of the Sabbath, there was a precedent for doing exactly what he did. The issue is not the Sabbath nor the responsibility of feeding or healing; rather this is all about a conflict of personality. The Pharisees see Jesus as an arrogant usurper and a dangerous youth who would tear apart everything they hold dear. Jesus sees the Pharisees as heart-hardened guardians of a faith that keeps people at arm’s length from full restoration and participation in God’s kingdom. These are two opposing forces that believe in mostly the same things. For all intents and purposes, they are on the same team, yet they are positioned as enemies. This might take some imagination on your part, but one could equate it with conflict within a team, or a family, or a church…which always seem to be the most painful conflicts, right? It’s the reason religion and politics are the taboo topics of today. We so closely associate our sense of self with our religious and political persuasions that we cannot entertain any other perspectives. We perceive different perspectives as direct threats to our sense of self. Even when we agree with one another 98% of the time, we fixate on the 2% in the other person that we don’t understand and refuse to take one step towards one another. And, as indicated at the end of today’s gospel, such conflicts are often drawn out to the bitter end, with the destruction one or both parties involved. I believe the antidote is humility, and again, I don’t look to the Jesus of today’s gospel passage for inspiration. Instead, here’s where I saw this idea play out recently. Throughout May a group of us read and discussed a book by self-described “lunatic libertarian Christian farmer” Joel Salatin. This book is his attempt to explain his theological rationale for his farming methods, which cover topics including free-range livestock, non-GMO crops, farming without pesticides and herbicides, and many more related topics. Very few people liked the book, to put it mildly. The primary reason was because the author comes across as very judgmental, harsh, rigid, and arrogant. The author believes deeply and passionately that his model of farming can feed the world and restore God’s creation; but he was unable to convince many of us because of his oppositional attitude and his unwillingness to compromise or empathize with the forces he was setting himself up against. Knowing that interest in the book was rapidly waning through the weeks, I scheduled a trip to Tyner Pond Farm in Greenfield this past week. This is the farming operation that provides home delivery throughout the Indy-area, as well as the meat and eggs to the Mug restaurants as well as Grigsby’s Station in Greenfield. I wanted to introduce our book group participants to the owners and farmers at Tyner Pond Farm because they were practicing Joel Salatin’s farming techniques in a tangible, accessible, inspiring, and humble way. 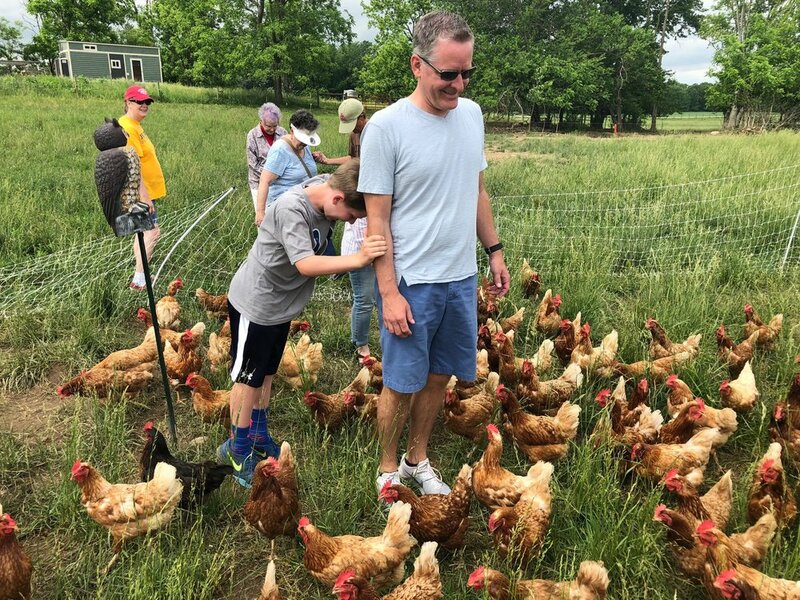 As you can imagine, our day at the farm was a completely different experience than anything that had happened in our book discussions at church. Amy Baggot, one of the owners and farmers, spent the entire morning with us, excitedly taking us from farm to farm introducing us to piglets, herds of cattle, and hundreds of chickens. She spoke with passion about her calling to raise animals in a way that honors their unique role in God’s creation. She talked about loving and being inspired by her animals. She embodied the important principles the author was trying to make in his book; but which we found inaccessible due to the author’s arrogance. And even the most skeptical among us were smiling at the glory of their farm. Our minds, and consequently our behaviors, are incredibly resistant to new information. Facts do not change our behavior. Other peoples’ insistence and/or arrogance does not change our behavior. In order for our behavior to change we must be inspired. Typically the ones who inspire us are the ones who are most passionate – ones for whom their passion is presented not from the volume of their voice or insistence they are right, but more from their ability to draw peace and hope from their passion and let it spread across their very way of being in the world. Today’s gospel is a warning about how easily we can become entrenched in our beliefs and how that entrenchment can lead to needless suffering and destruction. The flip side of this warning is the promise held out of just how easy it is to transform the world when our passions are expressed through expressions of humility, wonder, and grace. * Amy-Jill Levine, The Misunderstood Jew: The Church and the Scandal of the Jewish Jesus (San Francisco: HarperSanFrancisco, 2006), 33.